World of Warcraft: Battle for Azeroth OST, by Neal Acree || Blizzard Entertainment || Soprano singer || Tracks: Warbringers: Azshara || 2018. Immortalys, by Ivan Torrent || Soprano singer || Tracks: Facing Fears, Afterlife and Lux Imperia || 2016-2017. Elements, by Dirk Elhert || dos brains || Soprano singer || Tracks: Undefeated, Wings of Fire, The Last Haven and From Within || 2017. REND OST, by Neal Acree || Frostkeep Studios || Soprano singer featuring Einar Selvik (Wardruna) || Tracks: REND Main Theme, Day1 and Day 2 || 2017. Reverie: The Compilation Album, by Ivan Torrent || Soprano singer || Tracks: Crystalline and Architects of Life || 2014. Lux Imperia, by Ivan Torrent || Vocal Recording|| 2018. Facing Fears, by Ivan Torrent || Vocal Recording|| 2018. Afterlife, by Ivan Torrent || Vocal Recording|| 2018. Oath to the Abyss, by Antti Martikainen || Vocal Recording || 2018. The Last Haven, by Dirk Elhert || dos brains || Vocal Recording || 2018. Daylight, by James Minas and Lydia Davies || Moon&Sun || Vocal Recording || 2017. Dark Defender, by Andreas Wimmer || Vocal Recording || 2017. Star Marine Countdown, by Pedro Macedo Camacho || “Star Citizen: Star Marine” Cinematic Trailer || Cloud Imperium Games || Vocal Recording || 2016. Scarborough Fair, by Ignacio Núñez || Cover || Vocal Recording featuring TinWhistler || 2016. You are my friends, by Corentin Sauvage || “Collateral Beauty” Advertising Spot || Theta Sounds || Vocal Recording || 2016. Voyager, by Jean-Gabriel Raynaud || Halcyon || dos brains || Vocal Recording || 2016. Lif-e, by Ignacio Núñez || ION || Trailerrebel || Vocal Recording || 2016. Reborn, by James Minas and Lydia Davies || Battle Angel || Really Slow Motion || Vocal Recording || 2015. Breath, by Vivien Chebbah || “Chando” Advertising Spot || Vocal Recording || 2016. Electric Sun, by Celica Soldream and Abel Vegas || Composer, lyrics and vocal recording || 2015. Aireagán, by Celica Soldream and Abel Vegas || Composer || Tin whistle, percussion and vocal recording || 2015. Architects of Life, by Ivan Torrent || Vocal Recording|| 2014. Crystalline, by Ivan Torrent || Vocal Recording|| 2014. Echoes, by OMERTA || Inertial Inception || Lyrics || Vocal Recording || 2014. Mi Maldición, by KINNARA || Sinnbild pt. 1 || Vocal Recording || 2014. Jesucristo Superstar, Versión Sinfónica with Leo Jiménez, directed by Pepe Herrero || Produced by Marta G. Sarabia || Soprano choir singer || Madrid || 2017. La Noche de los Tiempos (Videoclip) || COTARD || Rock/Metal Band || Main Vocalist || Madrid || 2016. 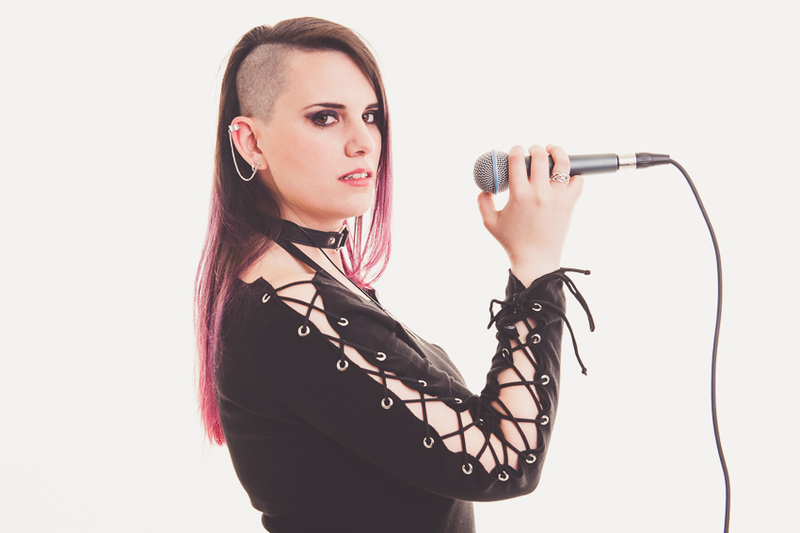 Ojibwa (Album) || COTARD || Rock/Metal Band || Main Vocalist || Madrid || 2016. “Celtia” (Era II: Vocal Codex), by Eduardo Tarilonte || Sample Library || Sampling Arts SL || Vocal Recording || Valladolid || 2016. “Heroica” (Era II: Medieval Legends Special Edition), by Eduardo Tarilonte || Sample Library || Sampling Arts SL || Vocal Recording || Madrid || 2014-2015. Nunca Mas Official Tour || COTARD || Rock/Metal Band || Main Vocalist || Spain || 2014-2015. Nunca Mas (Videoclip) || COTARD || Rock/Metal Band || Main Vocalist || Madrid || 2014. Nunca Mas (Album) || COTARD || Rock/Metal Band || Main Vocalist || Madrid ||2014. Warbringers: Azshara (World of Warcrat: Battle for Azeroth), with Warbringers: Azshara || Animated Short Videogame Trailer || Blizzard Entertainment || 2018. REND Early Access Lauch Trailer, with Day 1 || Cinematic Videogame Trailer || Frostkeep Studios || 2018. Hollywood Music in Media Awards, with The Last Haven || Classic/Instrumental Music || NOMINATED || 2017. REND Official Trailer, with REND Main Theme || Cinematic Videogame Trailer || Frostkeep Studios || 2017. Star Citizen: Star Marine Trailer, with Star Marine Countdown || Cinematic Videogame Trailer || Cloud Imperium Game || 2016. Era II: Vocal Codex Documentary, by Deane Ogden || Best Service || MENTIONED || 2016. Era II: Vocal Codex Teaser, with Cyberbrain Implant (Alive) by Abel Vegas || Best Service || 2016. Beauty and the Beast Official Trailer, with Reborn || Official Movie Trailer || Disney || 2016. Shure Vocal Mastery International Contest, with Electric Sun || Shure || 2ND POSITION (Earpro: Spain and Portugal) || 2016. Heavy Rock Magazine (Spain) with COTARD || Granitorock Festival Review || MENTIONED || 2015. Granitorock Festival, with COTARD || Rock || WINNER || 2015. Nubarock Festival, with COTARD || Metal || 2ND POSITION || 2014. Two Steps from Hell Youtube Contest, with Voices in the Blizzard and Black Armored || Two Steps from Hell || WINNER || 2013. Solfeggio, Harmony, Piano Basics and Musical Language || Pepe Herrero and Rubén Delgado || Albert’s Voices – Escuela profesional de canto || Madrid || 2015-Now. Modern/Rock/Lyric Singing Lessons || Miguel Ángel González, Beatriz Albert, Chus Herranz y José Pardial || Albert’s Voices – Escuela profesional de canto || Madrid || 2014-Now. Performance and Singing Lessons || Natalia Martín || Madrid || 2015-2016. Online Course “Developing your musicality” || Coursera || Berklee College of Music || Madrid || 2015. Grade 3 with “Merit” || Rockschool Official Exam || Madrid || 2015. Modern/Lyric Singing Lessons || Juan Ángel Bernal || Solmusic – Academia de Música || Madrid || 2011-2012. Modern/Lyric Transverse Flute Lessons and Solfeggio || Patricia de Andrés Flores || Solmusic – Academia de Música || Madrid || 2005-2011. Singing coacher || Albert’s Voices – Escuela profesional de canto || Madrid || 2015-Now. Singing coacher || Solmusic – Academia de música || Madrid || 2017-Now. Freelance singer for composers, producers and samples developers || Remote Recording Sessions || 2014-Now.